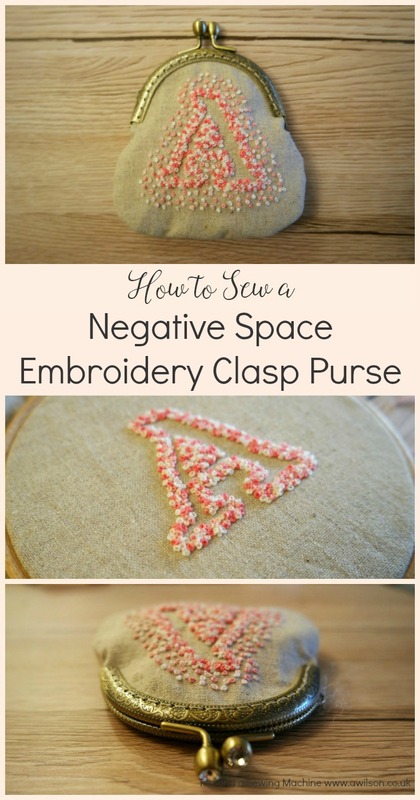 Negative space embroidery is a fun way to create letters and other simple shapes. Instead of embroidering the letter or the shape, you embroider the space around it. You can do this on all kinds of things (I’ve seen lovely embroidery hoop art things on Pinterest). I chose to do this to a little purse. I used the first letter of my name, but you could do anything, as long as it’s a simple shape! 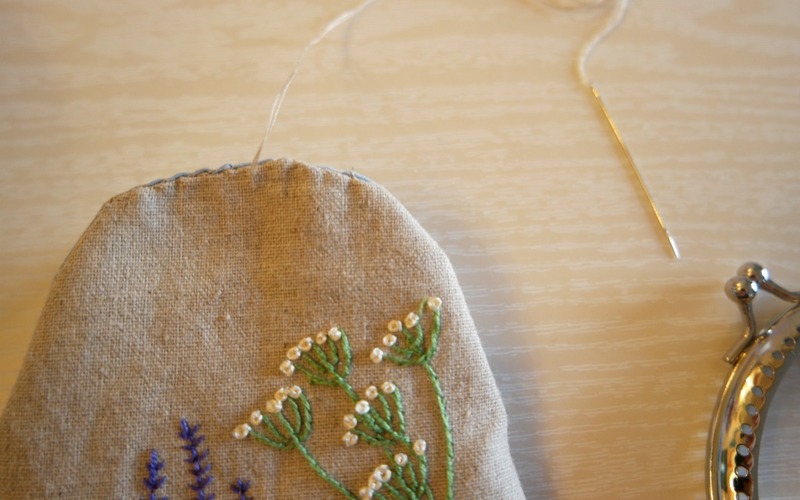 French knots are great for negative space embroidery. There’s something very satisfying about sewing French knots. Once you get the hang of it, they’re easy to do. The trick is to pull the thread tight around the needle, then poke the needle through the fabric next to where you started the stitch, not in the same place or your French knot will disappear! 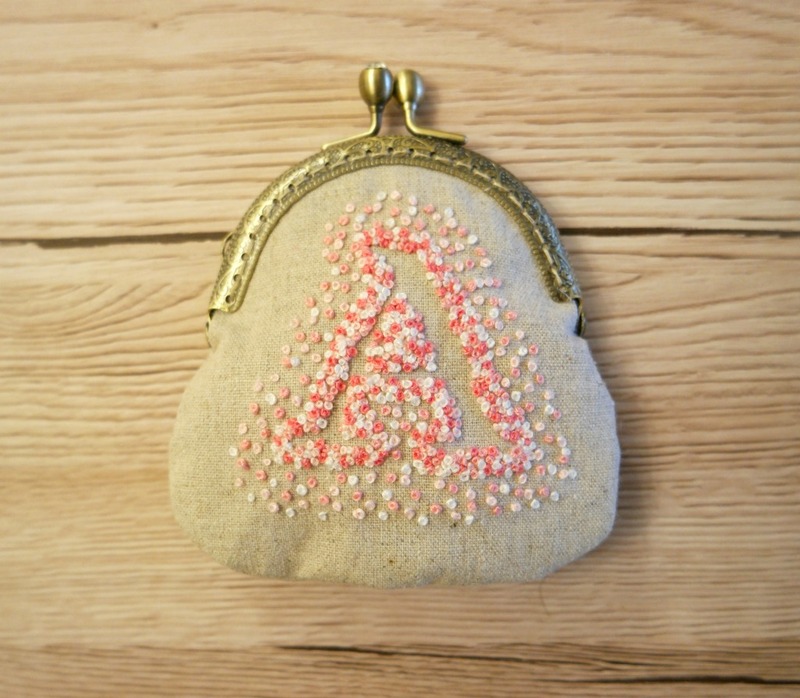 To make it up into a purse, I used the same method as I did for this embroidered clasp purse. Here’s a tutorial if you want to make one yourself! And you might be interested to know that I have these little purses as kits for sale here on Etsy. Fabric for the outer and the lining, a purse clasp , interfacing (optional), embroidery thread and a needle, Google Docs or similar and a printer, a pencil, usual sewing supplies. An embroidery hoop is also useful. 1. The purse clasp I used was approximately 9 cm x 6 cm (3.5 inches x 2.5 inches), and if you’re using one the same size, you can download the pattern pieces here. Otherwise you will need to make the pattern piece, and the instructions for doing this can be found in this tutorial here. 2. Once you’ve got your pattern piece sorted out, you can decide how big you need your letter to be. The easiest thing to do is to find a font you like on Google docs, type the letter and print it out. You will need to check that it will be the correct size, and don’t forget that your purse piece will include a seam allowance! For my letter, I used a font called Alice, in size 200. 3. 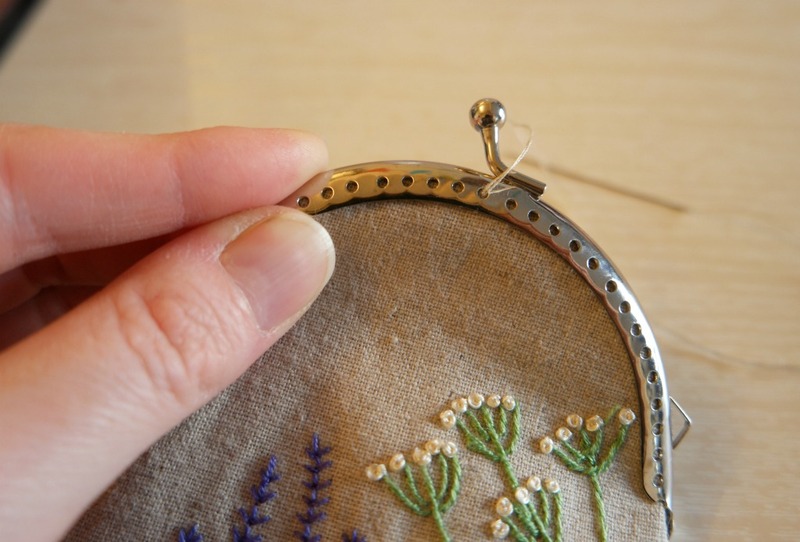 If you haven’t sewn French knots before, it’s probably a good idea to have a go on a spare piece of fabric first. There’s a tutorial here if you need one. Using your pattern piece, cut 2 pieces from your lining fabric and 2 from interfacing. Cut one from the outer, and for the other outer piece, draw it onto the fabric but don’t cut it out yet! It’s much easier to embroider it first, then cut it out when you’ve finished the letter. 1. Cut out the letter you printed and draw round it onto the fabric. 2. 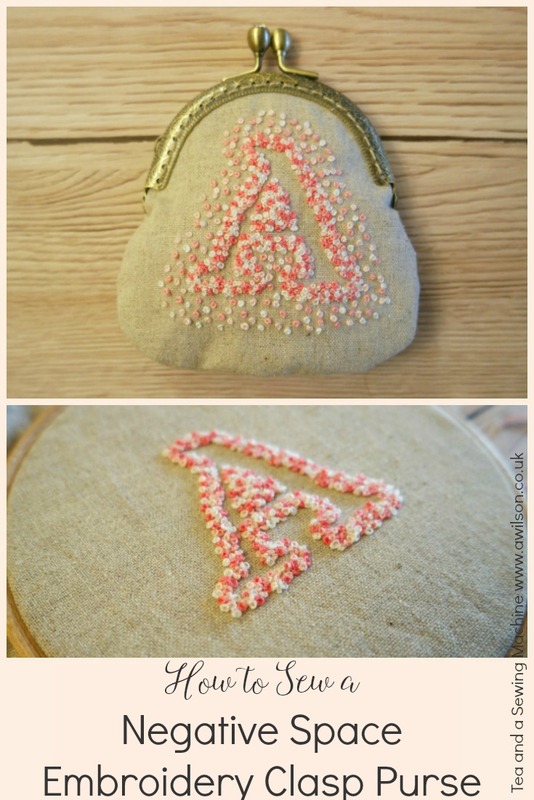 Start to sew French knots around the outside of your letter. If you’re using more than one colour or shade, space them out a bit so that you’ve got room to come back in with a different colour. I used 3 shades of pink plus white. 3. Once you’ve done this, go round again, then once more so that the French knots are 3 deep. If you have using a letter with a space inside, like an A, a P or a B, you might like to fill this in. 4. Now add some more French knots around your letter, but more spaced out. I did these mostly about 3 deep as well, but you can decide to do more or less depending on what you like! 1. Place one of the purse pieces on top of an interfacing piece with the right side up. Take the other outer piece and place that on top of the outer piece so that the right sides are together. Place the other piece of interfacing on top. 2. Take the clasp frame and line the top of the bobbles up with the top edge of the purse. Check that it is centred and that the distance all the way round the top between the clasp and the purse pieces is roughly the same. 3. Using pins, mark where the top of the hinges are on the purse pieces. 4. Sew the bottom of the purse outer between the pins. Repeat for the lining. 5. Pop the purse lining inside the outer so that the right sides are together. Pin the lining to the outer. Leaving an opening on one side, sew the lining to the outer. 6. Turn the purse the right way out. Slip stitch the opening. 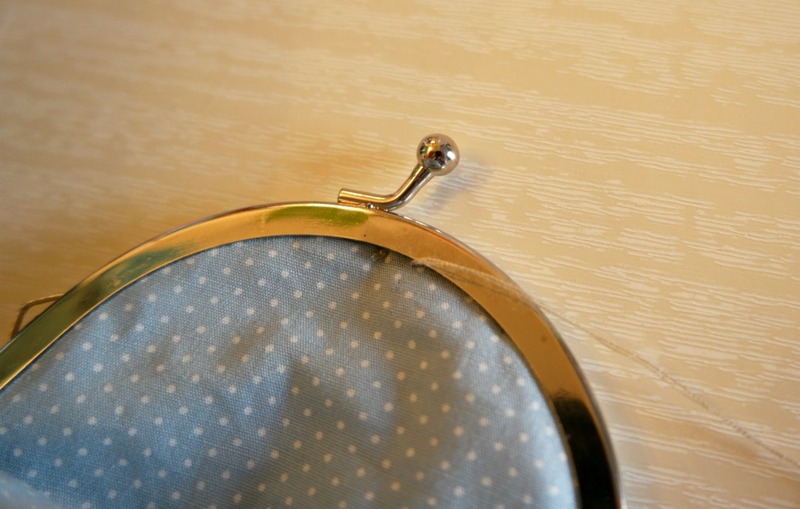 To sew in the purse frame, you will need to identify the centre hole on one side. 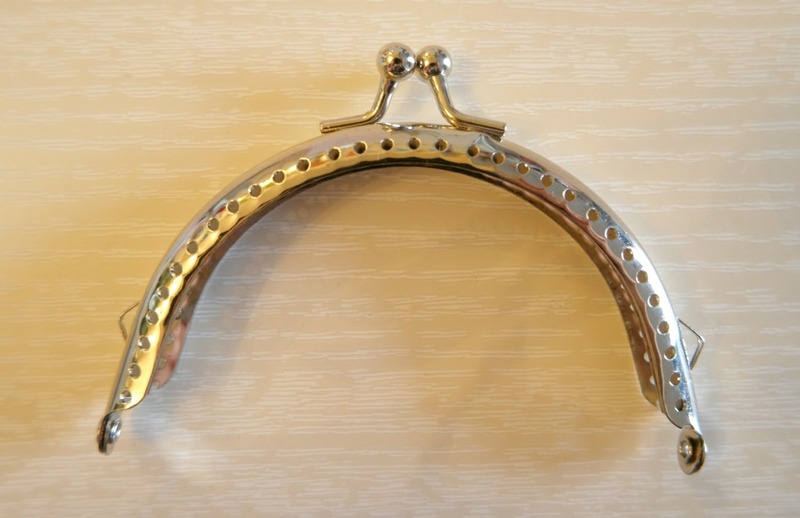 You will also need to find the centre of the top edge of your purse. The easiest way to do this is usually by folding it in half. 1. 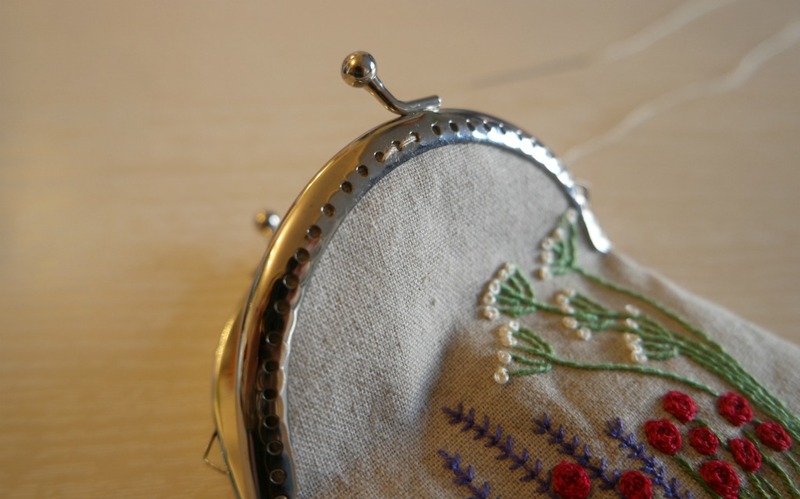 Take your needle and thread and bring the thread through from the inside of the purse to the outside, in the centre of the top edge, about 5 mm down from the edge. 2. Now bring the needle through that hole in the centre of the purse frame, from the inside to the outside. Push the edge of the purse into the purse frame so that it is right inside. Pull the thread taut. 3. Put the needle through the next hole and through the top of the purse. Pull it out through the other side so that it comes out just underneath the frame. You might need to do this at a bit of an angle. We’re aiming for the stitching to be hidden underneath the purse frame. 4. 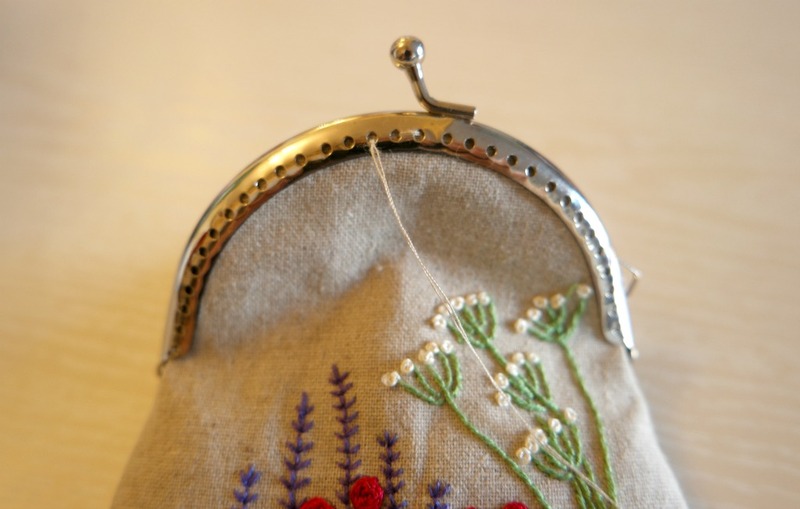 Take the needle back through the purse and the frame to the next hole. 5. Now put the needle through the hole where you ended the first stitch, through to the wrong side. 6. Pull it taut, then sew upwards through the second hole away from where you have just sewn. Keep checking that the edge of the purse is pushed right inside the purse frame. 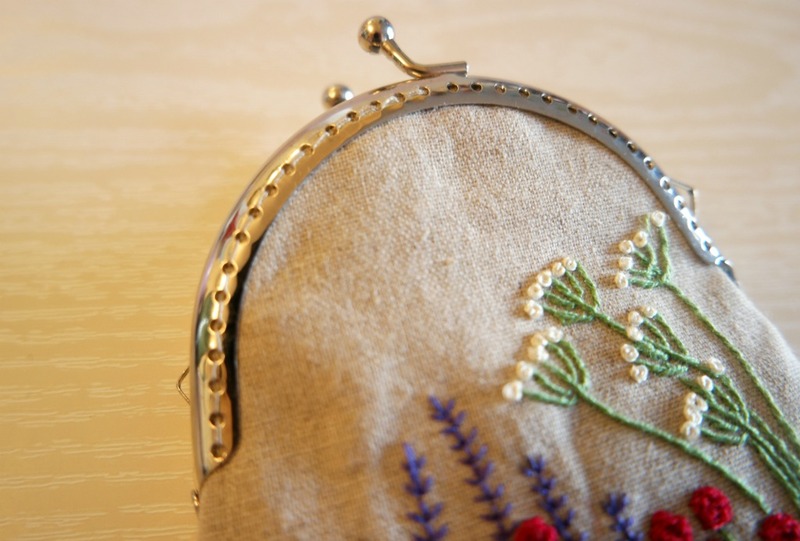 You are basically working a backstitch to sew the frame to the purse, with the neat bit of the backstitch visible on the front and the messier side hidden underneath the other side of the frame, on the inside of the purse. When you get to the hinge, tie the thread off on the wrong side. Then go back to the centre hole and sew the other half of that side to the purse in the same way. Now your little purse is finished!